Greenwich resident and former New York Lt. Gov. 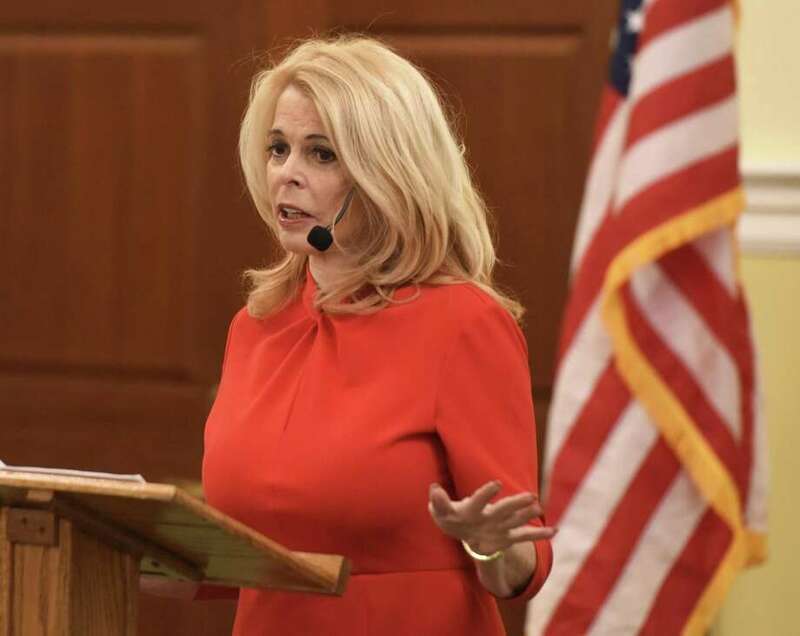 Betsy McCaughey presents “Beware of Health Policies That Will Shorten Your Life” during the Retired Men's Association's weekly speaker series at First Presbyterian Church in Greenwich, Conn. Wednesday, Jan. 23, 2019. McCaughey is an outspoken critic of the Affordable Care Act and author of "Beating Obamacare." GREENWICH — For more than 25 years, Greenwich resident Betsy McCaughey has been one of the most outspoken critics of government health care reform. And she continued that streak Wednesday morning in a speech at the Retired Men’s Association of Greenwich. A former Republican lieutenant governor of New York who once briefly ran for office as a Democrat, McCaughey said speaks out because she does not want to see anything stop innovation and advancement in medicine. “I try to call them as I see them based on the facts,” McCaughey said, pointing out that 39 percent fewer women die from breast cancer in the United States and 52 percent fewer men die from prostate cancer compared to 25 years ago. Life expectancy has increased, too: Someone turning 65 today will live four years longer and in better health than someone who turned 65 in 1970. And a baby born in 2019 will, on average, live 10 years longer than a baby born in 1950, she said. “These staggering achievements are all due to one thing: medical innovation,” McCaughey said. “My message today is, ‘Don’t let Washington kill this.’ Don’t let politicians on either side of the aisle discourage or impede medical innovation. U.S. Sen. Bernie Sanders, I-Vt., called for expanding Medicare to cover all Americans in his 2016 presidential campaign. The idea has gained steam ever since as the next step in health care reform, with several Democratic contenders for president in 2020 expressing support for it. But McCaughey said Medicare for All is a terrible idea, claiming that a bill Sanders introduced in 2017 would result in a system that would cost too much, provide less quality care and end innovation that saves lives. She also criticized proposals to put price controls on prescription drugs. Americans suffer from “sticker shock” at the cost of medicines, she said, but price controls would do more harm than good by delaying medical innovation. In the past, McCaughey has come under fire from both sides of the political aisle for her positions. She clashed often with then-Gov. George Pataki while serving as lieutenant governor for one term. Many of her claims about the impact of health care laws have been called out as lies, including her insistence that the ACA included “death panels,” which some ended up incorrectly believing was true. While she received both loud applause and criticism from the audience of more than 100, the audience at the RMA was entirely united with her on one topic: Reduce Infection Deaths, a group McCaughey founded that is dedicated to stopping infections at hospitals and health care facilities. Infections are caused primarily by dirty facilities and lax procedures, claims which had a lot of support from the audience. She called it “the most serious problem of all” and said the danger is worsening because the infections are more often multidrug resistant. When visiting someone in the hospital, she urged attendees to take bleach wipes to clean instead of flowers or candy, McCaughey said. Hospitals in the United States are not doing nearly enough to take precautions and properly clean, which can stop the infection, she said. A recording of McCaughey’s presentation will be posted online at www.greenwichrma.org with other past speeches.